Trinity's footballers overcame IT Cork yesterday thanks to two second-half goals. 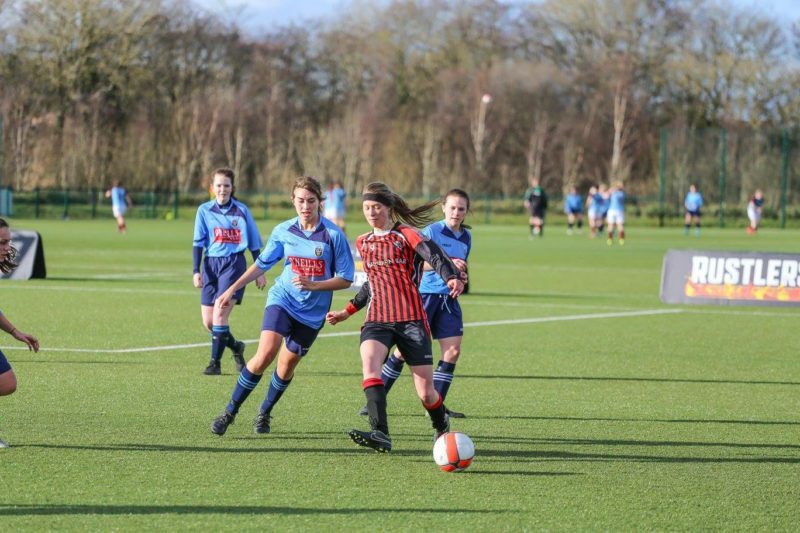 Goals from Aoife Robinson and Deirdre Byrne helped Trinity Women’s Soccer to a 2-0 win over IT Cork in the quarter-final of the Colleges and Universities Football League yesterday. The victory sets up a semi-final clash with Dublin Institute of Technology on February 11th. Both sides began the first half brightly, with positive spells in possession and chances created at both ends. Cork, dynamic in midfield, were stymied in their attacking endeavours by the visitors’ resolute defending. An entertaining half came to an end without either side having been breached and with the scoreline still reading 0-0. Trinity sprang out of the blocks after the break, beginning to move the ball quicker and utilise their pace on the wings. In midfield, clever football created chances, but still the game remained scoreless. This changed in the 70th minute, when a delightful ball from Charli-Ann Lynch found Robinson loitering. Robinson made no mistake, firing home the game’s opener. Fifteen minutes later Trinity made sure of the win, when Deirdre Byrne pounced on a rebound after her own effort was parried by the home side’s keeper. With the goal at her mercy, she made sure of the win and secured a mouthwatering opportunity for Trinity to qualify for the final of the competition. Yesterday’s win adds to an excellent start to 2019 so far for Trinity Women’s Soccer. In January, they came second at the regional futsal competition, earning themselves a spot in the finals of the plate in March. At the start of this year, the team, who previously went by Dublin University Ladies Association Football Club, rebranded to Trinity Women’s Soccer. The name change came after reservations about the use of the word “ladies” in the title of the club were raised at last year’s AGM.